It has sent rockets into space, produced millions of the world's smartphones and built high-speed trains. But until now, one bit of manufacturing had perhaps unexpectedly eluded China: the ballpoint pen. A year ago Premier Li Keqiang went on national television and bemoaned the failure of his country to produce a good quality version of this seemingly-simple implement. Locally-made versions felt "rough" compared to those from Germany, Switzerland and Japan, Mr Li complained. 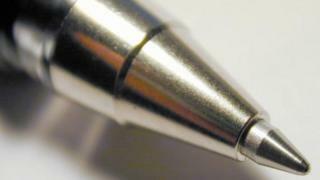 The problem was not the body of the pen, but the tip - the tiny ball that dispenses ink as you write. It might be something we take for granted, but making them requires high-precision machinery and very hard, ultra-thin steel plates. Put simply, China's steel has not been good enough. And it has struggled to shape its pen tips accurately. Without that ability, China's 3,000 penmakers have had to import this crucial component from abroad, costing the industry a reported 120m yuan ($17.3m; £14.3m) a year. But according to People's Daily, the state-owned Taiyuan Iron and Steel Co thinks it has cracked the problem, after five years of research. The first batch of 2.3-millimetre ballpoint pen tips has recently rolled off its production lines, the paper says. And once lab tests are completed, it's expected China could phase out pen tip imports completely within two years. On one level, whether China can make a great pen is not hugely important in the scheme of things. High-tech and innovative manufacturing lie at the heart of the central government's Made in China 2025 programme - designed to help domestic growth. Relatively low-value items, like ballpoint pens, have not been a priority. But the pen-conundrum is a symbolic one. Despite producing more than half of the world's crude iron and steel, China has still heavily relied on imports for high-grade steel. It was a failing that Mr Li said highlighted the need to upgrade China's manufacturing capabilities. "Historically, China has never been able to do precision engineering very well and the ballpoint pen is an example of that," says Professor George Huang, head of the University of Hong Kong's department of industrial and mechanical engineering. "Its parts are so small and very precise, and it's not easy to solve this problem"
Precision engineering is thriving only in certain sectors such as aerospace and defence where the government has placed a high priority, says Prof Huang. Even when it comes to smartphones and computers, the high end computer chips are usually imported from Japan and Taiwan. Prof Huang says that China lacks a culture of excellence in precision engineering. He uses the Mandarin term "fuzao" which describes something that is not 100% solid or reliable. "The culture is different from the Japanese and Germans," he says, who are known for innovation in engineering. "We Chinese are supposed to be craftsmen, but somehow the spirit is not as good." Additional reporting by the BBC's Tessa Wong.